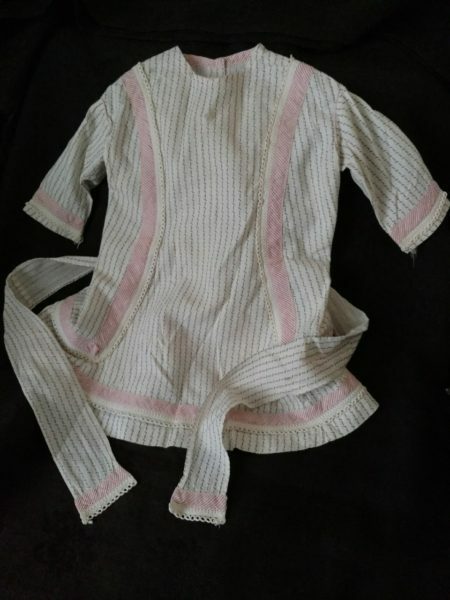 Looking for mid to later Victorian children clothing? Here’s a cute 1880’s style in a white with tiny black print calico. The little dress buttons completely down the back with pearl buttons. To further accent the back. a sash to tie into a bow. Front of dress is equally as cute, with its A shape style, embellished with vertical fabric trim in a red and white stripe, accented with a sweet whitework trim. This same red and white fabric is used for the narrow piping between the sleeve and shoulder of dress. Also a touch, at the edge of sleeves, plus two bands circling the hem of the skirt. Adorable for display, dress a doll, baby… or whatever your inspiration.